The Aging face, and how to Age Gracefully. Aging of the human face is the result of both superficial textural wrinkling of the skin and changes in the 3-dimensional (3-D) topography of the underlying structures. The skin, soft tissues (subcutaneous fat, muscle, and fascia), and structural support (bone and teeth) are individually affected by the aging process, but they also act in dynamic unison to determine the phenotypic presentation of the face throughout life. The major forces contributing to facial aging include gravity, skeletal remodeling, subcutaneous fat redistribution and loss, hormonal imbalance, chronic sun exposure, and smoking. Other environmental factors that are purported to affect facial appearance include mental stress, diet, work habits, drug abuse, and disease. Skeletal structure: Aging of the craniofacial skeleton is not merely the result of bone atrophy but is also due to a change in the relative dynamics of bone expansion and bone loss. There is an appreciable reduction in facial height, which is mainly due to changes in the maxilla and mandible, and a modest increase in facial width and depth. Subcutaneous fat distribution. The youthful face is characterized by a balanced distribution of superficial and deep fat, which highlights a well-rounded 3-D facial topography Facial aging is associated with loss of soft tissue fullness in certain areas (periorbital, forehead, malar, temporal, mandibular, mental, glabellar, and perioral sites) and persistence or hypertrophy of fat in others (submental, lateral nasolabial fold and labiomental crease, jowls, infraorbital fat pouches, and malar fat pad). In addition to redistribution of facial fat and loss of surrounding fullness, the fat pockets become more discernible as separate entities, as do many of the underlying facial structures. With age, the malar fat pad gradually slides forward and down to bulge against the nasolabial crease, giving rise to the prominence of the nasal fold in the aged face. What can we do about our Aging Face. How do we age gracefully? Dermall Fillers replace diminishing fat pads. Dermal fillers are an excellent choice for replacing lost volume in fat pads of the face. Dermal fillers come in many varieties for many different uses, each different filler will last a different amount of time depending on it’s makeup and placement. 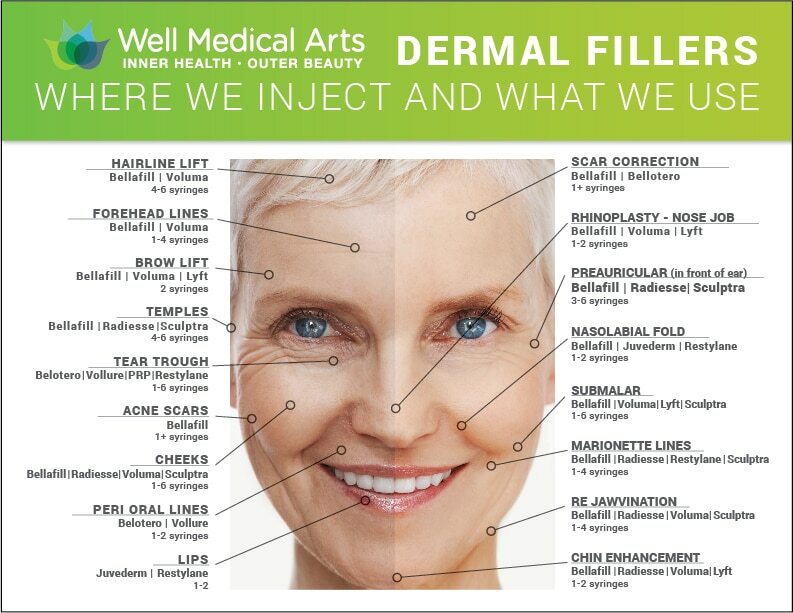 You can start to learn more about fillers at http://wellmedicalarts.com/dermal-filler/ Recently dermal fillers such as Bellafill have been proven to last up to 5 years. For those who prefer the All Natural route there are also fat transfer procedures such as the Almi Procedure that can help to replace lost volume. Often referred to as the “gateway drug” in esthetics, Botox and other similar neurotoxins can significantly reduce the appearance of moderate to severe wrinkles. Neurotoxins generally last around 3 months for most patients. Co2 Laser smooths skin texture. There are many options for fine lines and toning of the skin and each has it’s own benefits. Microneedle treatments can get great results clearing fine lines but will take a series of treatments to achieve the results. A fractional CO2 laser treatment can do what many Microneedle treatments do and more in just one treatment. Thread lifting uses fine dissolvable surgical threads to lift sagging skin and cause your body to stimulate it’s own production of collagen. These are just some of the options we have at our disposal. We would love to have you in and give you a personalized consultation to address your needs and develop a treatment plan to meet your goals. 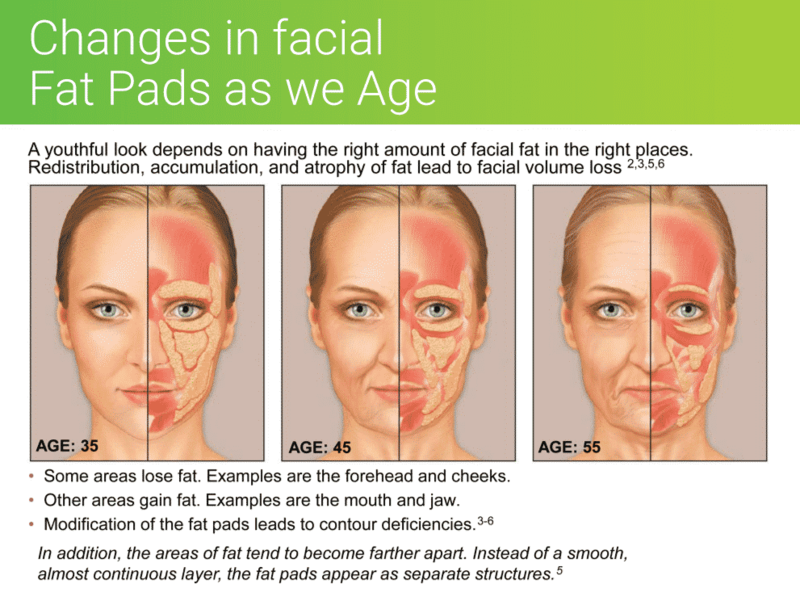 For a more detailed dive into Volume Loss and the Aging Face we recommend reading Dr. Syndey Coleman’s paper on the Aging Face. You can find a copy Dr. Colemans paper here. And for more additonal information that may be a bit easier to read you can check out.